Bottom Line Up Front: Yes, the game has its design flaws. But my family loves it; we always have a great time and keep coming back. Wrath of Ashardalon is a cooperative dungeon crawl and every player is in the hero party (no one needs to exclusively control the “bad guys” as I understand is required in Descent, Doom, Super Dungeon Explore, etc). Compared to “Drizzt” and “Ravenloft”, the other two games in the D&D Adventure System series, this game has the most traditional (trying to say “generic” as a positive) aesthetic. The big boss is a Red Dragon, the archetypal D&D villain. Components: Extremely satisfying, just like the others in the series. The big, heavy box is irresistible. 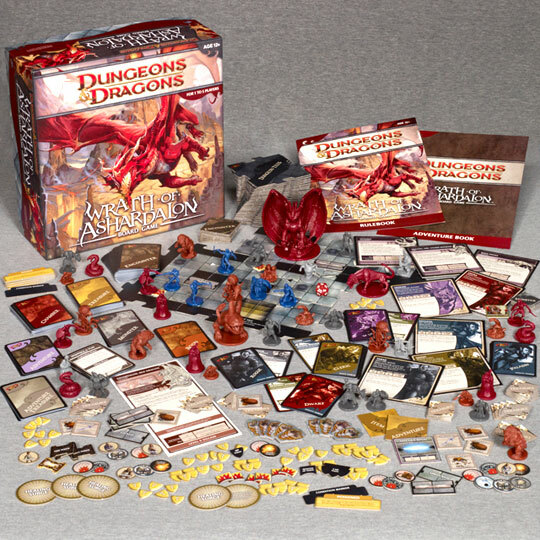 The approx 40minis are plastics from a previous D&D line (most are great sculpts, some are simply “good”), very sturdy interlocking dungeon floor tiles, 200 cards, rule book + scenario book, and piles of tokens/chits/cardboard pieces (many used rarely/sparingly to support a specific scenario). It’s very hard to nitpick with components. If I had to pick flaws: books are a little thin/flimsy (but within industry standard) and books could use some additional theme artwork to help establish feel. MSRP of $64.99 seems very reasonable, though it can be found for substantially less online. There are a number of different scenarios provided to keep things fresh. Many of the scenarios introduce alternative rules and many are supported with a fistful of chits designed just to support that campaign. Significant variety is afforded. You get different abilities to pick from for each character; some can be used as much as you want, some saved for special occasions. Defeating monsters will earn treasure and items ranging from possibly useful to very powerful. Attacks are determined by rolling a 20-sided die, adding modifiers specific to the creature/player ability and subtracting specified armor class. Damage is set (no other dice used). The monsters keep coming, but one or two hits usually defeat them (but there are a few heavyweights…). It’s generally the quantity and the negative encounters that stack up against you. For those that thought Ravenloft was too brutal on the players, and for those that thought the heroes in Drizzt were too powerful, this game probably comes closest in the series to the balance sweet-spot. Pardon me for borrowing language from my “Drizzt” review. My family’s has had a lot of fun with this series. I feel the game warranted my rating, which I suspect is above online gaming community norm. I hope this info and discussion of the games quirks can help you decide if this could be a fit for you as well. I also thought enough of this as a value to purchase all three games. 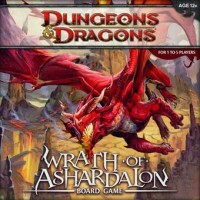 Add a Review for "Dungeons & Dragons: Wrath of Ashardalon"